Picking Bins SILAFIX | George Utz Ltd.
Utz plastic pick bins are known as SILAFIX and are ideal for industries where small items and parts need to be sorted and accessed regularly. For example factories, warehouse and storerooms. The open fronted containers allows for quick and easy access and helps optimise assembly line processes as well as organising workspaces allowing them to be kept tidy at all times. There are various sizes available in these picking containers, ranging from 500x310 mm to 92x102 mm with heights ranging from 54 mm to 200 mm. 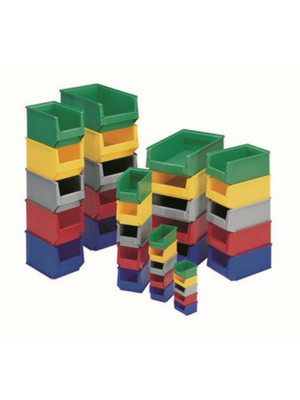 Colours available for these pick bins include; red, blue, green, grey and yellow. These containers are also available in ESD material to protect electronic parts against electrostatic discharge if required. Transparent lids to fit each of the different sizes of the SILAFIX range are also available.